Most homeschooling parents are pretty sick of the stereotypical homeschooling myths out there. Most of us just shrug it off and move on. But for some of us… let’s be honest. Some of us start to question ourselves after a while. Whether it’s after people repeatedly quiz our kids, or if we see a project that another kid of the same age did that we didn’t get to this year, or when our kid asks a question that we though they knew the answer to… We can start wondering if we’re doing a good job homeschooling. This questioning can be even more intense for those of us who choose to homeschool and also work from home. 1. Every kid learns differently and at a different pace. That’s one of the main reasons many of us choose to homeschool: so we can help our children learn at the pace that works best for them. There are times when you and your child(ren) will “fall behind” in your homeschooling. This is perfectly normal, and it happens in public and private schools, too. Perhaps you’ll even reach the end of a school year without checking all those boxes. But if the boxes you did check will stick with your child, then you’ve done a good job. You can always catch up. 2. What kids are “supposed to learn” at each age and grade is sometimes arbitrary. Yes, there are recommended ages and stages for learning different topics and mastering physical abilities. However, these aren’t always the same for every child. Actually, they’re rarely the same for every child. We have guidelines of what to teach when because we’re dealing with a large public, but even in the public school system, individualized education plans are sometimes created to ensure each child learns at their own pace. That means that in any given class, a child may not be checking all the boxes according to what the state or province says they should be checking. The same is true for homeschooled kids. My daughter was ready to learn to read at 4. So I taught her. She wasn’t ready to do difficult puzzles until about age 7. So that’s when we did them. My 6-year-old son, on the other hand, wasn’t overly interested in learning to read, but can do puzzles like a pro (unlike his mother). I’m still teaching him to read, but at his own pace. And I’m overcoming my difficulty with puzzles to help him with what he loves to do. My point is: if you’re teaching or helping your child learn what they’re ready to learn, they’ll retain the information better, and will probably retain a love of learning. 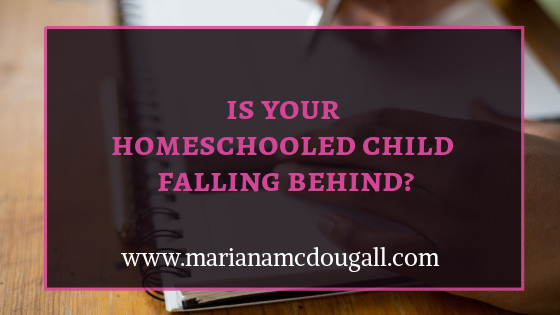 If your homeschooled child is “falling behind,” consider what catching up might mean: will your child still love to learn and still actually learn (instead of just memorize) if you try to shove more information into their day? If you’re committed to staying true to what your child is “supposed to learn” this year, you’ll need to check with your state or province, and hopefully obtain a checklist you can fill out. For Ontario, curriculum documents are easily accessible online. If you live in a province or state where reporting is mandatory, chances are, you already have checklists and/or curriculum documents at your disposal. In some states and provinces, reporting by homeschooling parents is a mandate. I’m fortunate enough to live in a province where I can direct my kids’ education to suit their learning styles and speeds. Having said that, I do like to ensure that they are fairly close in their learning to what the school system would be teaching. The reason for that is in case I ever do have to send them to school, I’d like them to go into the appropriate grade for their age. To that end, I do print out a checklist of the Ontario curriculum each year, and plan my lessons and life experiences accordingly. The Canadian Homeschooler has put together these super convenient checklists. That’s a great blog to follow for anyone homeschooling in Canada, by the way. Signing up for her mailing list will get you access to a library of awesome homeschooling resources. If you’re looking at this year’s homeschooling records and feeling like you’ve failed to check all the boxes, remember that you and your homeschooled kids can always catch up next year. This year, as I was looking over my checklists, I realized that we had missed a few things, and I was debating continuing to do school throughout the summer. I spoke to my husband, and he made a good point: we live in a province where if kids don’t meet all criteria, they still get passed on to the next grade. So what’s the difference between doing that, and catching up on the 3 or 4 things we didn’t get to this year, when we start school again? So I’ve called an official beginning to summer vacation (with lots of learning experiences, of course). We still “do school”—when the kids ask to do it. Yep, sometimes they ask, and I go with it. Why not? If, after reading all of this, you’re still experiencing “fear of missing out,” or FOMO, read this girl’s blog posts. Her stuff is totally worth reading for any homeschooling parent with a bit of doubt hanging around. What do you do when you feel like you’re falling behind in your homeschooling? What does falling behind mean to you? Next Next post: Setting Goals That Actually Work—FREE Worksheet!